Windmill is unique in its ability to deliver novel formulas from concept to consumer sale. With our broad capabilities, experience and superior service, we are committed to grow your VMS category sales. Windmill’s office and distribution centers consists of approximately 200,000 square feet in West Caldwell, New Jersey and Orlando, Florida. Warehouse layouts includes flow racks and pallet locations - all barcode controlled. 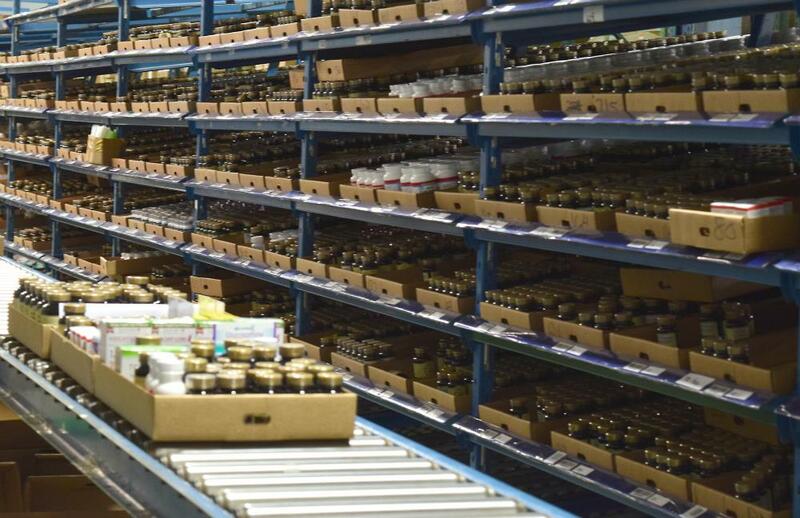 The warehouses are managed and orders are picked using RF scanners. The highest volume of shipments occur using UPS and Windmill runs UPS World Ship which is integrated with Microsoft NAV. Non-UPS shipments are handled by a variety of truckers depending on retailer requirements. Virtually all major customers are on EDI and Windmill is compliant with all required ASC X12 transaction sets. Independent retailer orders are received (85%) through our field sales representatives using proprietary order software on I-Pads and scanners directly connected to NAV. Independent pharmacy retailers can also place orders directly through our website, under the Pharmacist Corner tab. Windmill has successfully partnered with electronic retail and direct response companies that sought to expand their distribution into multiple channels. As an authorized vendor in this space, our experienced team is capable of managing the sales, logistics, marketing, and accounting of your product. If you want to explore further, please Contact Us via email, or call our Customer Care toll free number: 1-800-822-4320. Windmill products are distributed in over 150,000 retail doors nationwide. Windmill has been servicing a variety of retail channels for decades, including: chain drug, grocery, mass market, warehouse clubs, health food/specialty, convenience, and discount stores; along with direct to consumer, catalog, internet, government and military. Our highly experienced sales team services some of the most iconic retailers today with our top IRI brands. Our products are also distributed in over 25 countries, including: Singapore, Colombia, Philippines, Indonesia, Malaysia, Canada, United Kingdom, China, Japan, Taiwan, South America, Honduras, El Salvador, Saudi Arabia, Russia, Turkey, Mexico, South Africa, Australia, UAE, Romania, Panama, Chile, Bahamas, Vietnam and Iraq. Windmill services over 4,000 independent pharmacies with proprietary 4, 8 or 12 foot display planograms. The pharmacies are supported with a complete marketing and promotional program with front-end merchandising including: circulars, price stickers, promotional calendars, company-supported sale events, and point-of-purchase materials. Our field sales representatives visit each and every independent retailer at least monthly. In addition, our customer service staff is available to be contacted daily. Services range from straight brokerage to complete distribution including inventory management. Windmill also partners with our clients to provide customized products in select markets. Windmill’s executive sales team and representatives are deeply engaged in their accounts to sell-in and position products for optimal placement and sell-through.